Sheila Hudson recently spent a few days in Integrity Healthcare of Carbondale. She needed accelerated therapy. Our team of therapists had her ready to go back home in a short three weeks. 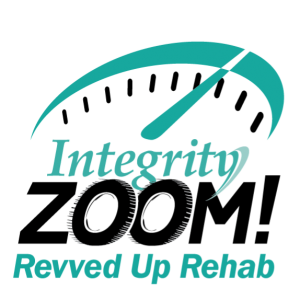 ZOOM Revved-Up Rehab, is our accelerated therapy program. After a stroke, after surgery or after a traumatic accident, our therapy program will return your loved one to their home as soon as possible. With highly skilled licensed therapists, we provide physical, occupational and speech therapy, and we work diligently to optimize the outcome for our residents. Families are often faced with the life-changing challenges that come after a loved one has experienced trauma. Surgeries, auto accidents, falls, strokes, heart attacks or the debilitating effects of cancer … all leave patients with the need to reduce pain while they rebuild strength and mobility. ZOOM! puts that process on the fast track! Our therapy team created a customized plan for Ms. Hudson. They identified bench marks and set goals and kept her on schedule! She said that our therapy team, “got her exactly where she needed to be so she could go home.” Going home was clearly her primary goal! Ms. Hudson had lots of good things to say about Integrity Healthcare of Carbondale. The food wasn’t home cooking, but it was good! She went to a few of the engagement activities, and they were fun! She said she just wanted to go home, but her experience was a good one and she will recommend the facility and the therapy team to others. How do we know all these things? Ms. Hudson is a part of our Plus 30 program. The movement of patients between health care settings can be a frightening process. Often times, families and caregivers feel lost in the transition. Patients change from primary care physicians to a hospital physician. Then they might move from the hospital to the care team as a patient in a skilled nursing facility. The next move for them might be to go back to their home. Integrity Healthcare Communities care about this transition. We do our part to improve these transitions for the residents that have entrusted their care to us with timely follow-up, support and coordination after the resident leaves our care setting. For at least 30 days, we continue to communicate with all who discharge from our communities. We send cards, telephone and make home visits if needed. We want to make sure our past residents are taking their medications and keeping appointments with their physician. We want to be certain that they are eating properly and that any at-home services are being provided. We never really say goodbye! If additional days of follow-up are required, we continue our program until we are satisfied that our past resident is doing well. ZOOM! … Plus 30 … is a really successful combination of services! We provide Care You Can Trust! We are Integrity!